The B & B "Pizziniaco Court" is in the heart of Lecce, it rises behind the old town, in one of the most distinctive districts of the city, a city founded in early'900 once known as "Borgo Pizziniaco", a district characterized by a heterogeneous that alternates a modest buildings and villas palazzotti bourgeois style "Liberty" and "Deco" according to the prevailing taste in the period. The B & B is located in the heart of the district, in Nicholas Cataldi (formerly Court Pizziniaco), a quiet courtyard. The B & B is a few hundred meters from the railway station, near the Provincial Museum "S. Castromediano "and the main bus stops for the province. S. Oronzo and the most beautiful Baroque architecture of Lecce, and Piazza Mazzini, the shopping center city can be reached by walking for 10 minutes. In the district, near the B & B also is in all stores, taverns, delicatessens, supermarkets, hairdressers and what else can serve. Lecce is the ideal to visit the Salento, convenient highways leading everywhere and almost all destinations in the province can be reached in half an hour by car. Lecce is 12 km. From the Adriatic Sea, 28 km. From the beautiful beaches of Porto Cesareo, 45 Km. From Otranto, 40Km. From Gallipoli, 75 km. 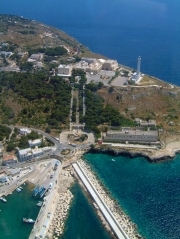 From S. Maria di Leuca (finibus earth). 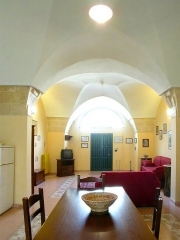 The B & B "Pizziniaco Court" is a recently renovated old building located in a quiet courtyard. The B & B consists of an elegant apartment historic on two floors and a large living room with kitchen on the ground floor, two bedrooms on the 1st floor and two bathrooms. Upstairs we have a great room with double bed with the possibility of adding a comfortable bed, a single here with the possibility of bed and a comfortable bathroom with tub and shower with a hairdryer, the rooms are bright and the single access to a covered balcony, the rooms have air conditioning. The property also has two beds cradle-opening. On the ground floor the spacious living room has a sofa that can be transformed, if necessary, into two single beds or a double bed, the floor is the bathroom. 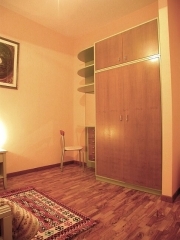 The apartment can accommodate up to 7 guests. The rooms on the ground floor, and ancient times with stone, are well aereati and bright. The area is full of cooking kitchen 4 burners, oven, refrigerator, dishwasher, washing machine, iron and ironing board. In the living area we have a library with assorted guides, maps and books descriptive of the territory in several languages but also novels and magazines, satellite TV, CD music and DVD video player. The ground floor has a small outdoor space to use clothes or otherwise. 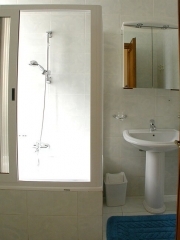 According to the most genuine tradition of hospitality of the B & B Europe, the owners live in an apartment adjacent and provide the most comprehensive assistance to every need of guests who will be accepted course in Italian but also in English. Traditionally the B & B offers exclusivity to their customers who should never share with other guests and / or ownership structure, in a formula that combines the comfort of a holiday home at cost of Bed & Breakfast. Bath towels and bed linen is changed once a week together with a general cleaning. For lunch, the property offers everything you need but the preparation is made for the guests. The B & B is located in a quiet courtyard with free parking near the outer confidential and subject to availability of even a parking garage. Coming from Brindisi, arrived at the north of Lecce continue until the big crossing beneath the walls of Charles V (Piazzale Forts), continue straight on VIALE DE PIETRO, turn right on VIALE XXV July, until the castle of Charles V, After the Castle turn left onto Viale Marconi and then immediately right into VIALE THE RE at the end of V.le Lo Re, a large roundabout, then reversed "U" on VIALE OTRANTO and turn immediately to the first right there will be in VIA THE DOLPHIN, VIA NICOLA CATALDI is the first right, continue straight on passing an intersection, the B & B is the last house on the left at the end of the court.